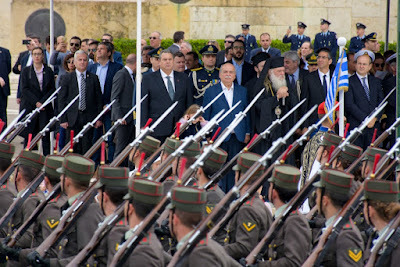 THE NEW ATHENIAN: Greece vs. Turkey: Are we headed for an Intra-NATO War? The prospect of such hostilities has been suddenly brought closer this year, following events that are individually and as a series without parallel in recent decades. Last autumn, Greek foreign minister Nikos Kotzias expressed concern that Turkey had become an “irritable power.” What inspired this concern was a record 3,317 airspace and 1,998 territorial water violations recorded in the Aegean last year—respectively double and quadruple the previous year’s numbers. “Our job is to behave responsibly,” Kotzias declared, so he invited Recep Tayyip Erdogan to become the first Turkish president in six decades to visit Greece. "It has no gaps. It needs neither revision nor updating. It stands as it is, it covers absolutely the issues that it needs to cover, and stresses that among other things it leaves no leeway for gray zones or minority issues," Pavlopoulos said. Kotzias’s charm offensive has since collapsed. A planned February revival of the Greek-Turkish Supreme Council, a diplomatic forum, never took place, and a May visit to Athens by the Turkish foreign minister is very much in doubt. But there is worse. On February 12, a Turkish coast guard vessel rammed a Greek one while performing what the Greek coast guard called “dangerous maneuvers inconsistent with international collision avoidance practices.” Turkish Prime Minister Binali Yildirim called Tsipras to explain that the ramming was accidental; but the fact that it happened near Imia, a pair of Greek islets whose ownership Turkey has disputed for 20 years, suggests to the Greeks a territorial power play. Turkey upped the ante on the last day of February, arresting two Greek officers who apparently strayed into Turkish territory while on a routine patrol on the Thracian border. The standard practice for both sides during the last three decades has been to return wayward patrols at the nearest checkpoint after a routine procedure. Turkish authorities instead jailed the men and charged them with illegal entry. More serious charges may follow. 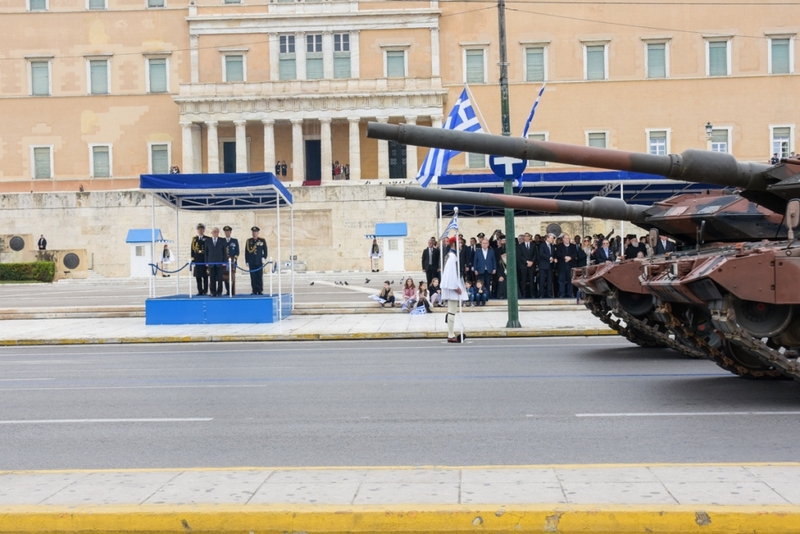 Greek Defense minister Panos Kammenos refers to the two soldiers as “hostages,” and Greek public opinion takes for granted their seizure as connected with the ten Turkish military fugitives. Since these incidents, polls say 92 percent of Greeks believe Turkey constitutes Greece’s biggest threat. Is Turkey generating grievances as a pretext for war? Who would gain from such a war? How would America react? And why has Erdogan chosen this moment to escalate tension? Brinkmanship in 1996: preview of a far worse confrontation? “What I worry about is the risk of an unintentional confrontation,” says U.S. ambassador to Athens Geoffrey Pyatt. Greece and Turkey nearly did stumble into war two decades ago. On Christmas Day 1995, the Figen Akat, a small Turkish cargo ship, ran aground on the western twin islet of Imia. A Greek tug was dispatched to refloat her, but the Turkish captain refused Greek help, saying he was in Turkish territorial waters. He eventually accepted Greek assistance, but not before the Turkish government had voiced a claim to the Imia islets as Turkish. In the new year, the mayor of the largest nearby Greek island, Kalymnos, hoisted a Greek flag on Imia. The owners of a newly-licensed Turkish television channel CNN Turk decided to boost ratings by filming two journalists replacing the Greek flag with a Turkish one. Prime Minister Tansu Ciller fueled the fire. “We can’t let a foreign flag fly on Turkish soil. The flag will come down,” she said. “The Turkish claims have no basis at all. 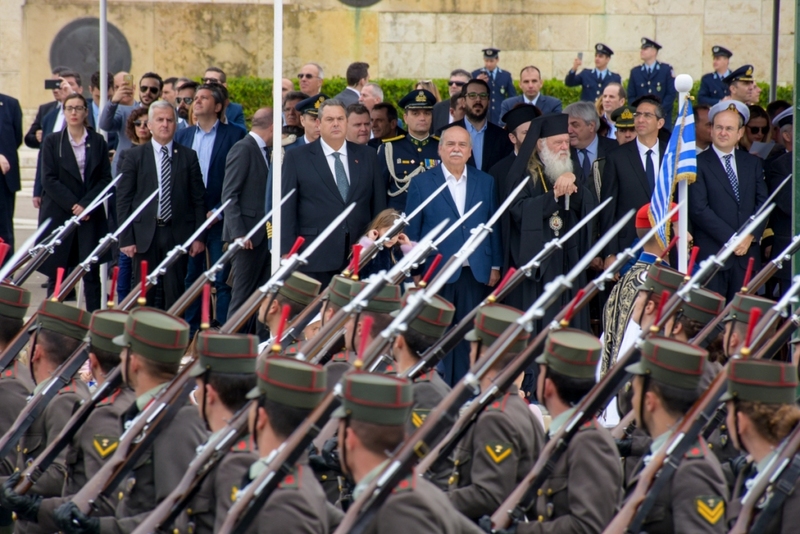 There is no space for negotiations in … matters which concern our sovereignty,” said Greek Premier Kostas Simitis. Greece landed special forces on one of the two islets while Turkish frogmen took the other. As many as 20 Greek and Turkish ships and submarines converged on Imia (or Kardik, as the Turks call it). Imia stands as a textbook case of calculated escalation leading to the brink of an unintended war, and conditions now are even more conducive to such a war than they were in 1996, because new causes of instability have been added to older ones. Those future talks are important, because Greece and Turkey have a number of unsettled jurisdictional issues. Under international law, Greece can claim territorial waters of 12 nautical miles around each of its islands, but Turkey threatens to wage war if Greece does so, claiming the Aegean, as a semi-enclosed sea, is a special case. And the two countries have yet to apportion the continental shelf and settle rights to mineral deposits on and under the sea floor. Exploratory talks have been ongoing since 2000, but Turkey broke them off last summer. This has become known as the “grey zones” policy, which aims to cast doubt on the status of anything between a couple of dozen to a couple of hundred uninhabited or sparsely inhabited Aegean islets. Turkish claims are spread throughout the Aegean, but her frustrations focus on the Dodecanese, the island group in the southeast Aegean, which were the last to formally join Greece. The Lausanne Treaty awarded them to Italy, naming the 12 principal islands “and the islets dependent thereon.” Nine years later, Italy signed a protocol with Turkey, which included British Admiralty maps and clearly delineated territorial waters, showing which islets lie in whose sovereign area. In the Paris Treaty of 1947, Greece inherited Italy’s possessions and treaty obligations. Turkey now objects that it had never formally ratified the protocol. For Erdogan, who faces re-election next year, there is more at stake than power. In 2013, a judicial investigation was launched into his family’s assets after telephone conversations were leaked suggesting that he had amassed a personal fortune of more than a billion dollars while in office. He shut the investigation down in the name of national security, then imprisoned the prosecutors. But “Erdogan needs to survive politically so he can avoid legal prosecution. That’s what it comes down to,” says the Turkey expert. “You have an explosive mix of regional or even global ambition to the point of arrogance, on the one hand, and instability on the other,” says Dokos. Under Erdogan, Turkey has come to see itself very differently from the secular state forged by Kemal Ataturk, which joined NATO, applied to join the E.U., and generally played by Euro-Atlantic rules. Erdogan has ruled the country for almost 16 years, and during that time its GDP has grown fourfold and its foreign policy has become increasingly Islamic and assertive. Turkey has directly challenged the United States on Syria, entering the fray to attack the Kurds, whom it sees as an existential threat but who have been America’s frontline troops against the Islamic State. In March, Turkey won its first major victory in Syria, taking the town of Afrin 20 miles from its border. It now plans to move on the town of Manbij, 60 miles to the east, creating the buffer zone it has long sought between its own restive Kurdish citizens and the heavily armed Kurdish militias in Syria and Iraq. Turkey has become the only regional power straddling the world’s two major alliances, acting both on behalf of NATO and in concert with Russia—and it is doing so within the same conflict. Turkey is also putting its foot down in the eastern Mediterranean. On February 9, five Turkish navy ships prevented a drilling platform contracted by Italian energy company ENI from reaching its intended site offshore northeast Cyprus. ENI is one of six energy multinationals—including Qatar Petroleum, France’s Total and ExxonMobil—which have signed agreements to dig exploratory wells on Cyprus’s continental shelf. Those wells are scheduled to be completed by the end of this year; early tests have confirmed deposits of 3.6 to 6 trillion cubic feet of natural gas and indicated the prospect of much more. Cyprus has been divided since a 1974 Turkish invasion created a universally unrecognized Turkish-Cypriot state in the north. Greek Cypriots say they will share the island’s newfound resource wealth when they reach a reunification settlement. Turkey counters that this wealth shouldn’t be used as ransom to extort such a settlement that disadvantages Turkish Cypriots. Turkey therefore rejects the Cypriot exclusive economic zone assertion and says it will conduct its own exploratory drilling, setting the stage for another confrontation in the eastern Mediterranean. Many experts believe it is this agenda that drives the latest belligerence in the Aegean. Turkey’s defense capabilities have risen with its economy, while Greece’s have suffered as a result of its eight-year depression. Last year Turkey spent $15.8 billion on defence; Greece could manage only $5.4 billion, and almost none of that was investment in new weapons. In fact, Greece has cut its defense expenditure by 40 percent in the last decade. This means it has spent no money on procurements other than ordnance. Meanwhile, Turkey is purchasing the F-35 stealth fighter and is pouring billions into developing its own mounted cannon and armored vehicle. Greece’s domestic defense industry has suffered so much disinvestment that four years ago it nearly lost the ability to make its own bullets and service its aircraft. Thanks to previous investments, Greece is for now a formidable adversary. Its forces almost match Turkey’s numerically, and it has covered the Aegean with overlapping anti-aircraft missile defense shields. Over time, though, military experts say, Greece’s ability to mount a credible defense will erode without new investments. Against the advance of hyper-nationalism, the Turkish military may no longer be a reliable barrier. Following the July 2016 coup attempt, Erdogan imprisoned an estimated 50,000 public servants, most of them from the armed forces. By some accounts, that has deprived Turkey of a fighter wing’s worth of pilots experienced in taking calculated risks, and many of its most experienced commanders at sea. Dokos believes the ramming of the Greek coastguard vessel near Imia last month was the result of those purges. The combination of an aggressive foreign policy and an inexperienced military is made worse by the fact that the two defense ministers have such a bad relationship that they do not speak. By some accounts, the direct line between the Greek and Turkish chiefs of staff has also fallen into disuse. Such statements reaffirm the Greeks’ traditional belief in their NATO and E.U. memberships as security shields. But few Greeks expect concrete action from either the E.U. or the United States or NATO, should push come to shove. NATO Secretary General Jens Stoltenberg recently told the Greeks that they’d have to extricate their wayward soldiers from Turkey on their own, disappointing Greek hopes that NATO would enforce collegial norms among Alliance members. NATO has also declined to take any formal position on the Lausanne and Paris treaties—effectively encouraging Turkey’s disputatiousness. NATO’s Stoltenberg has even refrained from criticizing Turkey for attacking the Kurds. “Turkey is contributing to our collective security, to our missions and operations in many different ways. I thank Turkey for that," Stoltenberg told Anadolu Agency in March”. Turkey’s longstanding aspirations to join the European Union have all but ceased to provide meaningful leverage. Greece lifted its objections to Turkish membership in 1999, reasoning that a democratic, European Turkey would present less of a threat. That decision yielded dividends for a decade. It has become apparent, at least to Erdogan, that major European powers have no intention of letting Turkey in, so Erdogan’s strategic calculations no longer include the need for deference to the E.U. The E.U.’s handling of the refugee crisis has further weakened Greece by isolating it from the European core and making Turkey indispensable. In February 2016, Austria prevailed on the police forces of the former Yugoslavia to close the Balkan route that allowed refugees from the Middle East and Africa to reach central Europe on foot. A barbed wire fence went up on former Yugoslav Macedonia’s border, which trapped tens of thousands of refugees in Greece. The following month, the European Union signed its “Statement” with Turkey, whereby Turkey would retain refugees seeking to leave its shores, and take those back who failed to qualify for asylum in Europe. Greece was itself trapped between these two arrangements—left outside Vienna’s Balkan security blanket but still the recipient of refugees whom Turkey could not or would not apprehend. Refugee arrivals to Europe have fallen dramatically thanks to these two actions—from more than a million in 2015 to 172,000 last year. Greece, however, reaps the least benefit of anyone in the E.U. from this. Under European rules, refugees must apply for asylum in the first E.U. member state they reach. Prevailing smuggling routes put the most pressure on Greece, Italy, Malta and France. Last year, Greece received more new asylum applications in proportion to its population than any other E.U. member. It is currently processing 57,000 asylum applications—9 percent of the E.U. total—whereas the European Commission has apportioned to Greece 1.6 percent on the basis of population and prosperity. Yet many E.U .members remain reluctant to renegotiate Europe’s asylum rules, requiring frontline states like Greece to bear the brunt. Turkey’s new usefulness to Europe has arguably given it more leverage against Brussels than the other way around. Despite his political differences with Erdogan, the Dutch premier recently praised Turkey for its implementation of the agreement, highlighting its supreme importance to Europe. “I think Turkey has adhered extremely well to the refugee agreement,” Mark Rutte told parliament on the Statement’s second anniversary. “It’s how Greece is implementing the agreement that needs looking into, not Turkey,” he added, an apparent reference to Greece’s slowness in deporting ineligible asylum applicants. For its services, Turkey has been promised $3.7 billion a year, with Europe “in a hostage situation” according to Rozakis. The Statement turned Greece’s eastern Aegean islands into a buffer zone, where most refugees are confined until their cases are heard. This has alienated Europe’s frontier from its heartland and put the eastern Aegean very much at the mercy of Turkish goodwill in enforcing the agreement. Europe’s contracting of Turkey to defend external E.U. borders which Ankara disputes has made Greece’s Aegean possessions a much riper target for Turkish hawks. As the post-World War One order in the Middle East begins to unravel, the order Lausanne instituted in the Aegean may follow suit. John Psaropoulos is an independent journalist who has covered Greece and the Balkans since the fall of communism. He writes and broadcasts for, among others, the Daily Beast, the Washington Post, the American Scholar, and Al Jazeera English. His blog is thenewathenian.com.